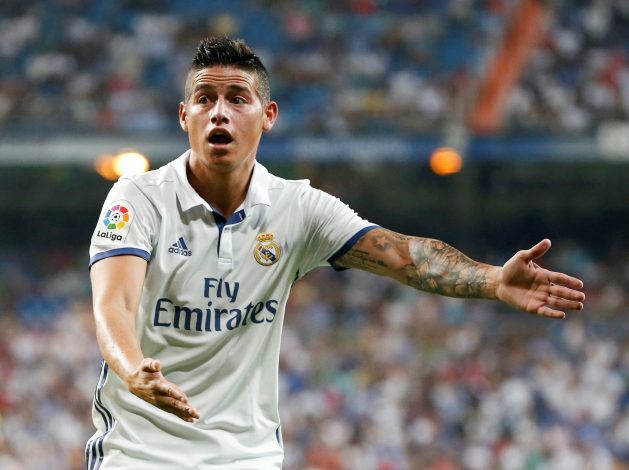 Real Madrid star James Rodriguez has issued a ‘Come and get me’ plea to Manchester United boss Jose Mourinho, according to the Mirror. With the Colombian looking to leave Spain after a fallout with Madrid’s boss Zinedine Zidane, Old Trafford is allegedly his preferred destination. And the 25-year-old would love to make the move during the ongoing transfer window, according to the Mirror. Accordingly, his agent Jorge Mendes is in talks with United executive Vice-chairman Ed Woodward. Mendes is also the agent for Red Devil’s manager Jose Mourinho. Among other big name clubs looking for the signature of the playmaker are Chelsea and Paris Saint-Germain. Even though Rodriguez was repeatedly linked to a move to Manchester to play for Louis Van Gaal, former Blancos boss Mourinho seems less interested. This attitude might change though, if the Portuguese manages to offload Morgan Schneiderlin, Marouane Fellaini and Memphis Depay. Rodriguez’s career is seemingly in Mourinho’s hands now, and the player should hope his agent’s personal connection will help him make the switch to England. But the truth is it’s been a nightmare for him under Zidane, and he now wants Mourinho and United to end it.